The Green Man represents the lushness of flourishing vegetation and the coming of spring and summer and is a symbol of rebirth and the co-dependence between nature and man. Figures such as Sylvanus, Derg Corra, Green George, Jack in the green, John Barleycorn, Robin Goodfellow, Puck, and the Green Knight all share aspects of the Green Man's nature. Fantasy art, pagan gods, pastel painting. Green Lady / Forest Queen, forest goddess. 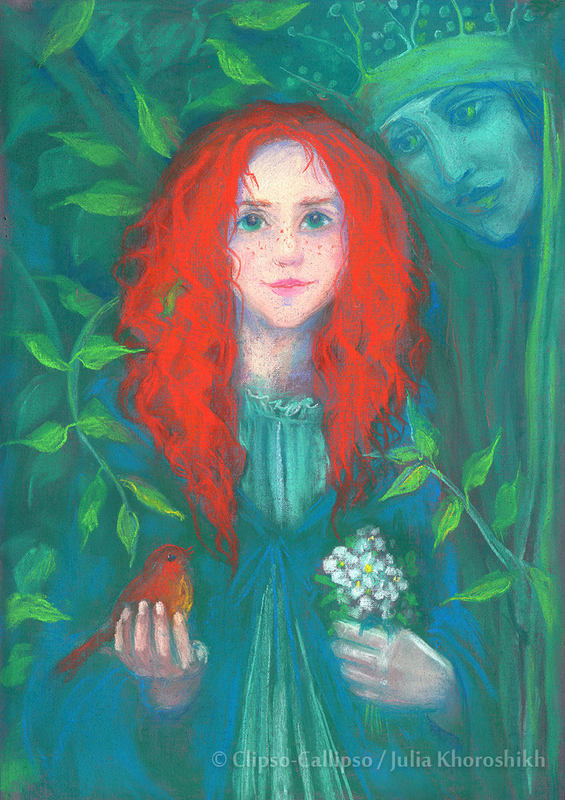 Green Woman - female counterpart of the Green Man. Beautiful woman's face surrounded by the green foliage. Child of the Forest. Pastel painting, 34 x 48 cm, 2016. Fantasy art, magical green forest. Ginger haired girl with orange bird and white flowers in her hands, Dryad or Elven Queen hugging the child by her branches. 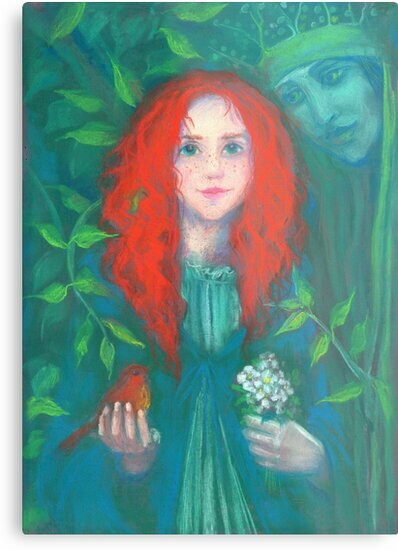 Artwork was inspired by celtic legends, Irish fairy tales and Shawna Mac photographs of one lovely little girl. Artwork titled "The Summer". 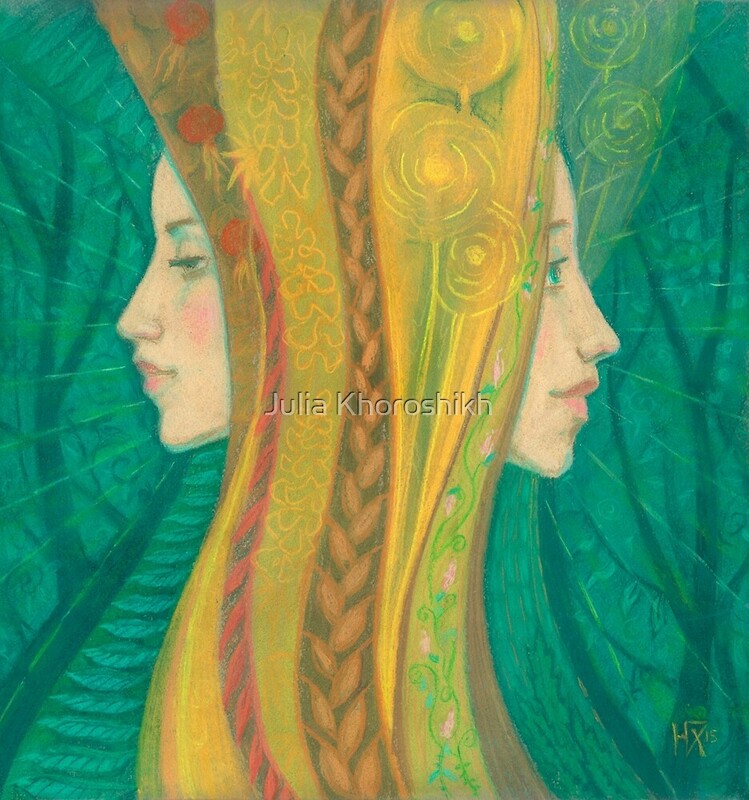 Two beautiful dryads with shining yellow hair in the magic green forest. Fantasy / surreal / visionary art, green and yellow colors. Any commercial use of these images is forbidden.